Believing that supernatural marriages are a sign and a wonder in the world today, Dr. Dan and Linda Wilson have dedicated their lives to drawing couples into this Holy Spirit-driven type of intimacy. Happily married for 30+ years, Dan and Linda are the co-founders of Supernatural Marriage Ministries in Fort Worth, Texas. In their book 'CO - Powerful Partnerships in Marriage', they have brought together true life stories of couples that have learned through experience how to work together for the same goal. This book will help you walk out your life with the companion that God has sent you in a more fulfilling way. It features chapters from the following contributors: Dr. Paul & Teri Loone, Dr. Che & Sue Ahn, Steve & Marci Fish, Joshua & Janet Angela Mills, Bart & Kim Hadaway, Robert & Katie Souza. Dr. Dan and Lindas passion is to see couples CO-love, CO-honor, CO-labor and CO-enjoy the fullness of all Christ has called them to be and do. This book, with the variety of authors who have contributed to the content, will release vision, hope, encouragement and impartation. Couples of the past and present draw back the curtains, revealing different aspects of their marriages where they have tapped into the power of CO-. As co-heirs they walk together in power and confidence toward their destinies. You too, can live a life of fulfillment with supernatural blessings in your marriage, family and zone of influence. Come and discover the richness of CO-! CO - Powerful Partnerships In Marriage Paperback Book was published by XP Publishing in February 2012 and is our 25657th best seller. 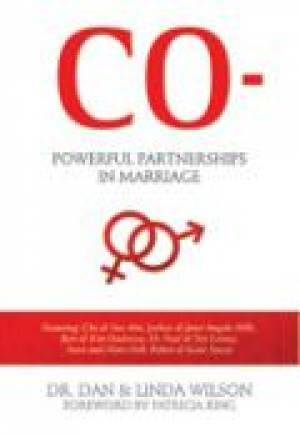 The ISBN for CO - Powerful Partnerships In Marriage Paperback Book is 9781936101696. Be the first to review CO - Powerful Partnerships In Marriage Paperback Book! Got a question? No problem! Just click here to ask us about CO - Powerful Partnerships In Marriage Paperback Book.